The first thing to notice when listening to this disc is excellent quality of the recording. The original LPs were obviously splendid sources and the transfers have been very successful. In many of these historical transfers series Naxos have presented the material in chronological order - Caruso, Gigli, Lehmann, McCormack to mention a few. Here producer David Lennick has chosen a thematic principle with in this volume Tarrega and Ponce sharing the space and with a few odd numbers from other composers. Jean-Delphin Alard was a violinist, composer and professor at the Paris Conservatoire where his best known pupil was Sarasate. The Study in A, known as Estudio brillante, was written for violin and arranged for guitar by Tarrega. It is often believed that he is the composer. It is a fine piece and it has something of Tarrega’s melodic sweetness. That Tarrega was inspired by Chopin is easy to hear in the Mazurka in G, which is also a fine example of Segovia’s flexible playing: how he lingers lovingly on some phrases. He also gives the well known Requerdos de la Alhambra an inward reading. The tremolo playing is impeccable but it is the lyrical expression and the ebb and flow of the music that makes the greatest impression. It seems that Albeniz’s Asturias could have been conceived for the guitar from the beginning – it sounds so idiomatic in this version. Aguirre’s and Malats’s pieces are also fine and the playing of Malats’s Serenata española is again so flexible. The numbering of Ponce’s preludes is not according to the published order of all 24 but Segovia’s own edition from 1930. The Thème varié et Finale is an atmospheric piece while the sonata is harsher than one associates with Ponce. 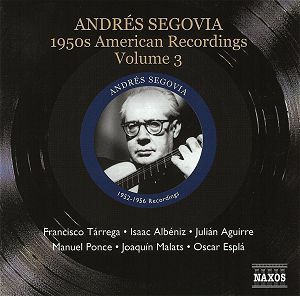 Segovia appreciated it explicitly and described it in a letter in 1927 as ‘quite beautiful, and an important work for the guitar, the artist and the musician’. The second movement is like a folk song and the finale is technically demanding with some tremolo. Oscar Esplá had studied composition with Saint-Saëns and became professor at the Madrid Conservatoire in 1932. He composed operas, ballets, choral works and a lot of instrumental pieces. Levantine Impressions were written for the piano in 1931 and are folk-like and melodious. I can’t imagine them, or anything else on the disc, more idiomatically performed and guitarists and music lovers in general should derive lots of pleasure from this issue. A fourth volume is due for release before long.